Tonight I put on a movie while the kids were on Facetime with a friend. I was looking for a chick flick that wasn't too chicky. 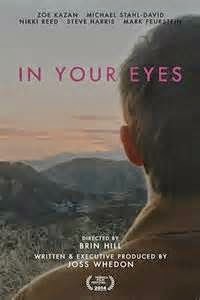 In Your Eyes written and produced by Joss Whedon is about two people who for some reason find themselves emotionally connected even though they have never met. Rebecca Porter (Zoe Kazan) is a timid doctor's wife whose life appears to be fundraisers in New Hampshire. Dylan Kershaw (Michael Stahl-David) lives in New Mexico trying to straighten his life out after a short prison sentence. They didn't just connect one day but have been connected for 20 years although they both thought it was just a thing. Apparently their first contact was right before Rebecca has a sledding accident as a child. Unfortunately for these two their telepathic connection causes them to make others look at them like they are crazy. They talk out loud to what appears to be no one and can see what the other is looking at. So if there is a fire near one, the other jumps up in the middle of a quiet dinner fanning flames screaming hot, and put it in the sink. There were a few times that I thought, put a bluetooth ear piece in and be done with it. However, I loved how they got to know each other sharing and talking through the craziness of life. My favorite part was the friendship they created as they got to know each other. The actors are adorable and likeable. I had trouble with the concept of Rebecca and her doctor husband and wondered how these two complete opposites could have even got together in the first place. As for the husband played by Max Feuerstein I wasn't sure if he was an angry, distant husband as he appeared in the beginning, a jealous husband or a concerned husband. He appeared to be all of these. I thought this movie was different and completely fell in love with these two main actors. Oh before I forget, Jennifer Grey is also in the movie and looks amazing!